Greek cuisine, with a long history of four centuries, is an integral part of Greek culture. The raw materials used for Greek dishes are natural, such as vegetables, grains, olive oil, meat, fish or wine. Culinary habits of Greeks are often a model for imitation, as the reputation of Greek cuisine keeps growing. 1. Tzatzíki – The Famous and Addictive Greek Dipping Sauce! 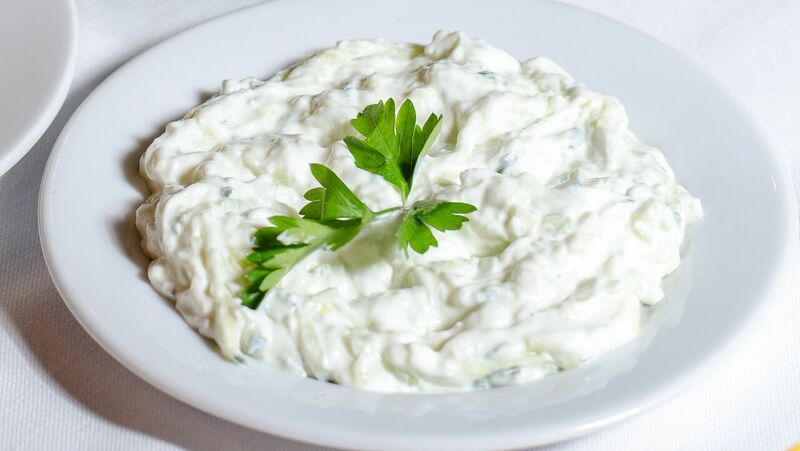 Probably the most famous Greek dipping sauce with yogurt, garlic, cucumber, salt and olive oil. Tzatzíki is perfect to accompany grilled meat and a great sauce for dipping your bread and fries in it! 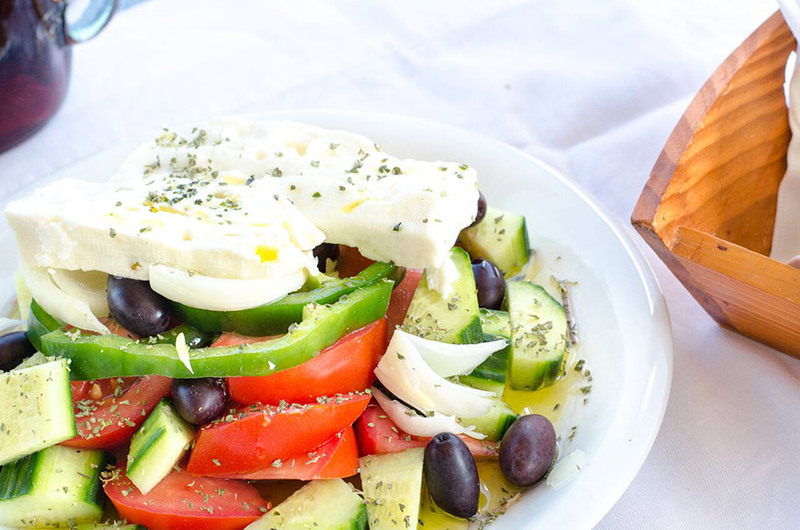 The traditional Greek Salad (aka Horiatiki) It is an incomparable Greek dish for its taste and nutritional value. It is a mix of feta (white cheese), tomatoes, black olives, onions and plenty of olive oil. You can accompany with a few slices of bread, dipped in the olive oil that will remain on the plate. It is such a hearty dish, that many order it as a main course. 3. Souvlàki (Gyros) – Greece’s “National Dish” for Everyone! It is considered as the “national dish” of Greece and has an excellent reputation in every part of the earth. Many are those who have tried to imitate the manufacture abroad, but souvlaki in Greece is really unique! 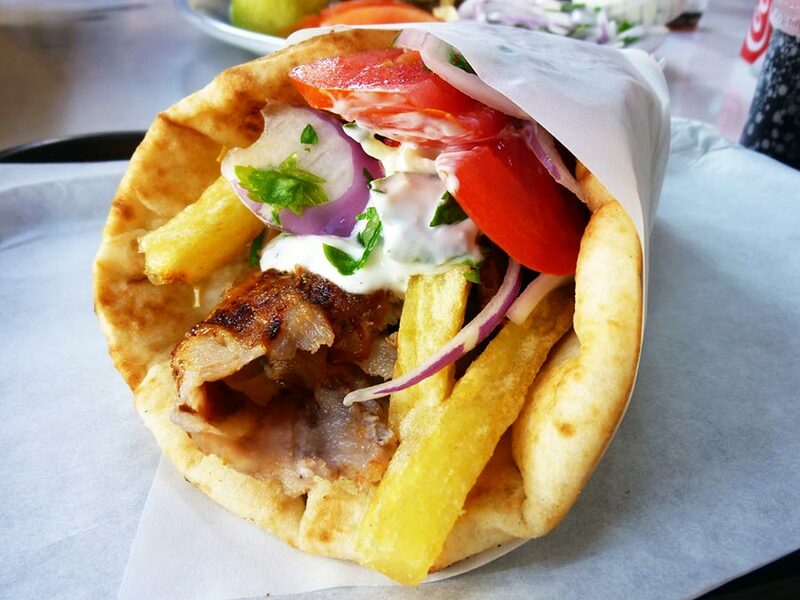 With gyros pork or chicken, lots of tzatziki or yoghurt, onions, tomatoes and potatoes wrapped in pie bread, souvlaki is the most delicious meal for any time of day. Moussaka is undoubtedly, one of the most typical Greek dishes. With eggplants, béchamel and meat is one of the best dishes we can recommend to every foreigner who visits our country. 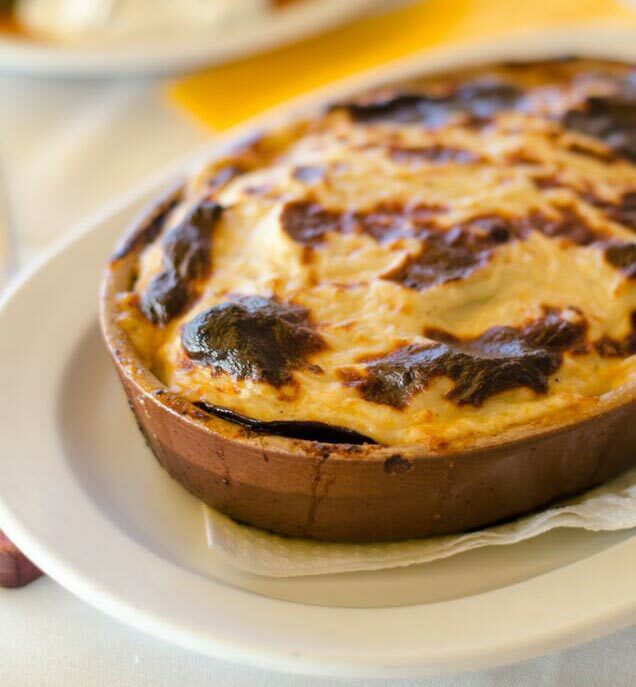 It is one of the most popular dishes of the summer and it is no coincidence that most tourists coming to Greece, eager to taste the famous “Greek Moussaka”. 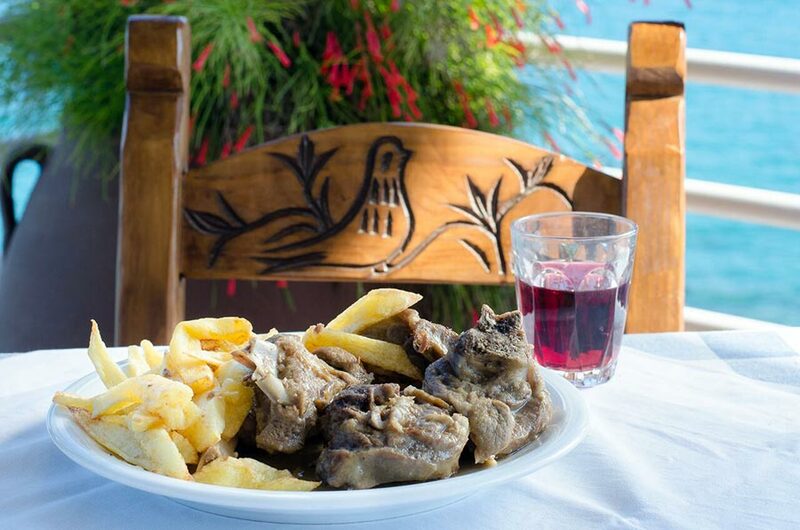 Tsigariasto is a Cretan dish that stands out for its tastiness. 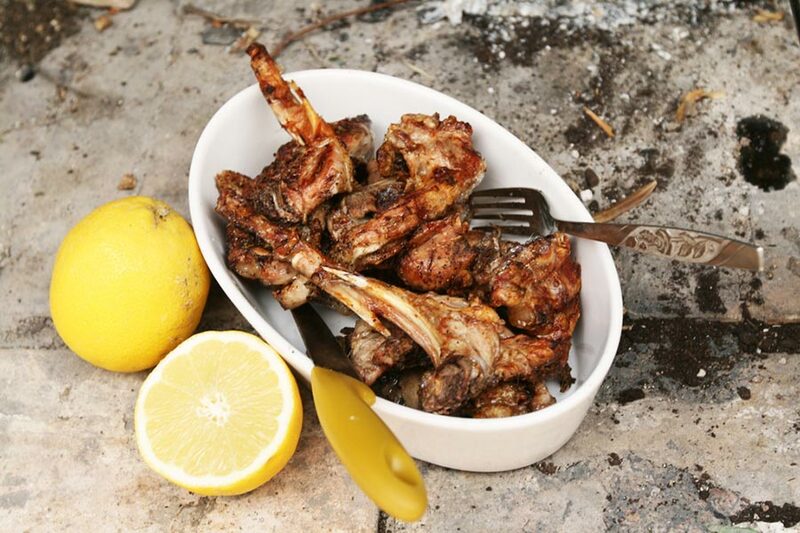 Its basic ingredient is Cretan goat or lamb, cooked in Cretan olive oil. The meat is of high quality and it is cooked at a very low temperature for a long time. It is usually served with fries. Greek pies are definitely the hallmark of Greece. Traditional dough is filled with cheeses, meat, herbs or any other Greek products and then is cooked in the oven, until it becomes crunchy. It is a great delicacy, preferred at all hours of the day, for breakfast, lunch or midnight meal, appetizer or main course. 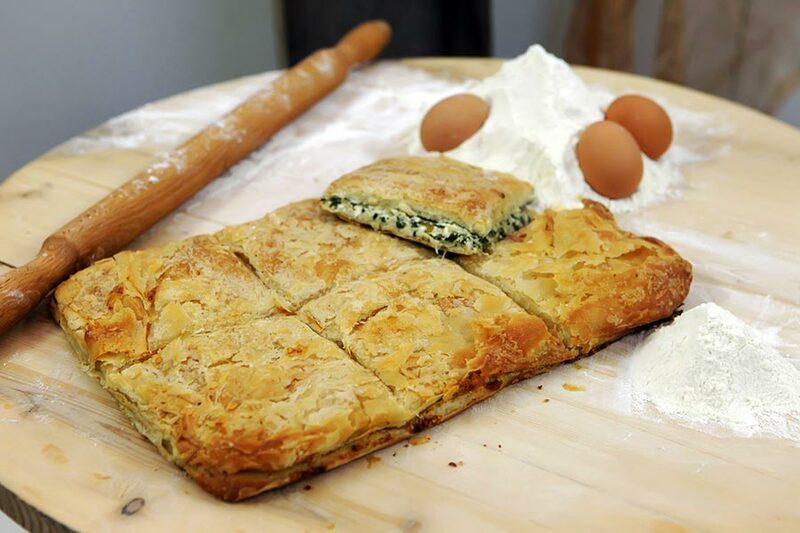 Spinach pie (photo below), cheese pie, pumpkin pie and meat pie are only a few of the most delicious Greek pies. The Greek grilled lamb chops are marinated before being grilled over the charcoal fire with salt, pepper, oregano and a little bit of olive oil. To enjoy their taste in all its glory, just eat them with your hands! Their smell is mouthwatering and delicious. 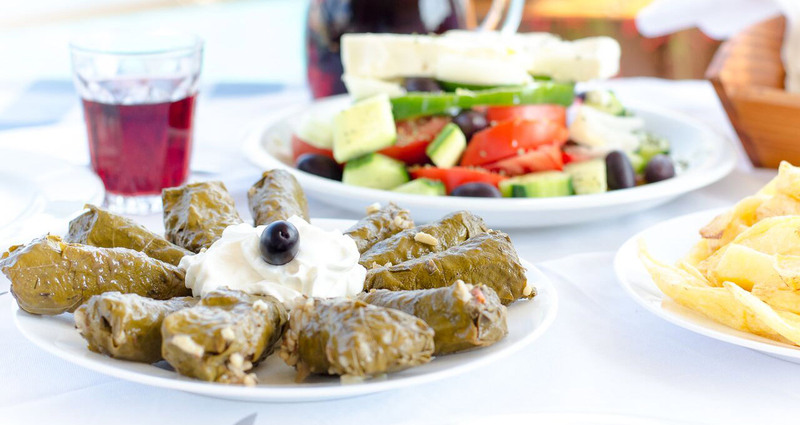 The dolmades with vine leaves or those with leaf cabbage are the most popular, as they are very soft, and their rice, sometimes mixed with minced meat and spices, is very tasty. 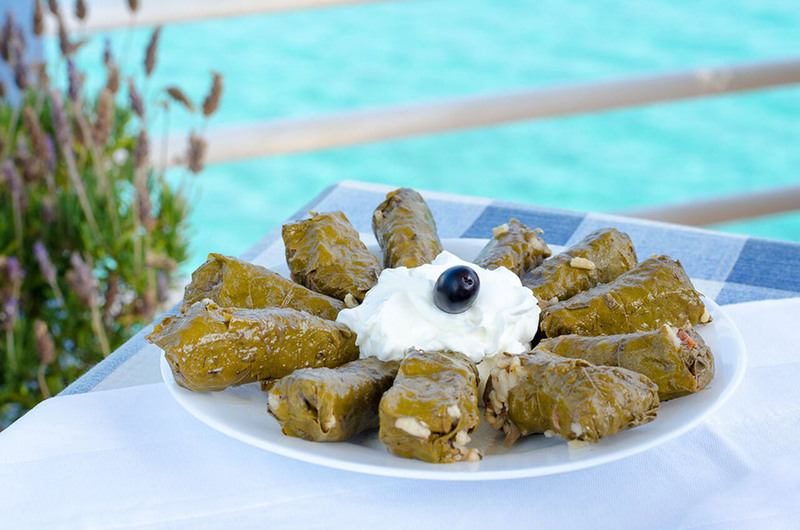 In order dolmades to be successful, the rice must be granular. They are eaten plain or with egg and lemon sauce. Their preparation may be cumbersome, but their taste is incomparable! 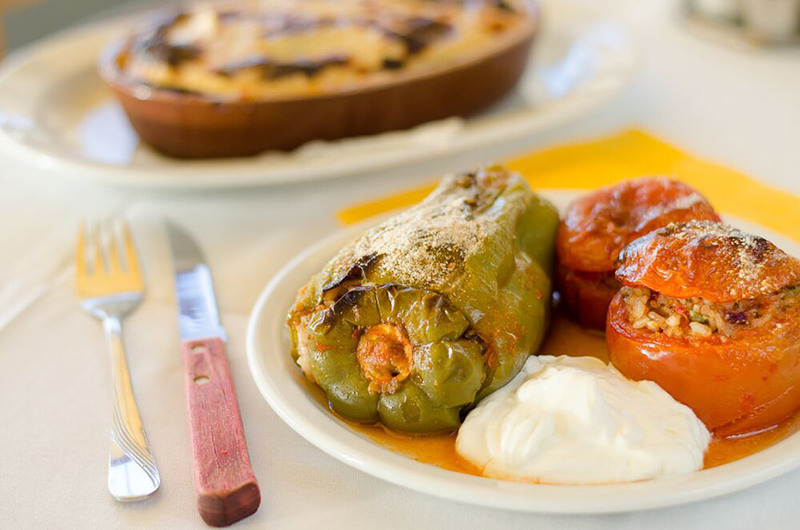 Gemistà is one of our favorite Greek dishes! Tomatoes, peppers, eggplants or zucchini are filled with rice, dill, mint and, sometimes minced meat and cooked in the oven. In Crete, you will be served Gemistà accompanied with yogurt. In any version cooked, braised, stewed or with vinegar, is delicious. Especially the picture of hung octopus “basking” in the sun, is the hallmark of the Greek summer. Most visitors prefer grilled octopus, the perfect summer delicacy. 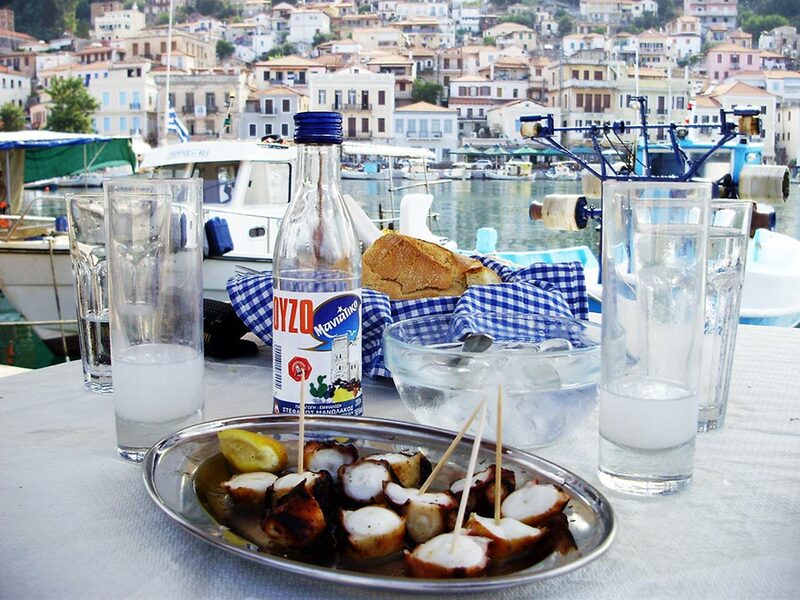 Octopus is best served with the the ultimate Greek drink, Ouzo. It accompanies perfectly seafood dishes and it is usually enjoyed by the sea. With plenty of ice, it excites every visitor. Do not forget of course the good Greek wine, with fine varieties and labels with important distinctions. Great set of dishes. I think all of them is a must try if you visit Greece!